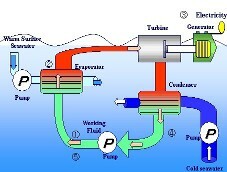 TPE uses the temperature differential between deep (40 F) and shallow waters (80 F) to drive its ORCs and produce power and, as a by-product, fresh water through desalination. 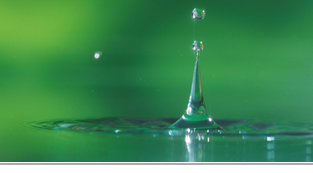 Very few OTEC systems were developed as they had an overall efficiency of only 1 to 3%. TPE's system can offer you a maximum efficiency between 6 and 9% due to our unique designs and proprietary refrigerant blends. TPE's designs are configured to operate continuously as a base load power generation system. TPE's OTEC ORCs produce an excellent return on your investment. 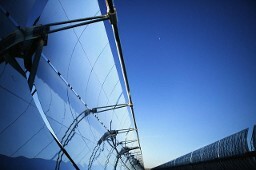 Most solar thermal systems use hot oil to boil water creating steam that drives a steam turbine to generate power. In contrast, TransPacific Energy does not build solar plants, we heighten their efficiency. Our technology enables direct heat recovery from the solar collectors' coolant. We use this heat to produce super-heated vapor that drives our turbine. Thus generating power at a higher efficiency. TPE's custom design uses air-cooled condensers that make our system easy to install in remote areas. 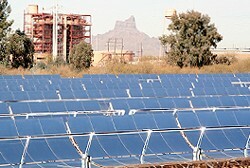 Solar Thermal Variable Flow - System flow may vary through the panels requiring a receiver. Solar Thermal With Storage - Both constant and variable flows can use thermal storage to provide power 24/7.